WHO : On the ring finger, ulnar to the distal phalanx, 0.1 F-cun proximal to the ulnar corner of the fingernail, at the intersection of the vertical line of the ulnar side of the nail and the horizontal line of the base of the fingernail. WHO : On the dorsum of the hand, in the depression superior to the web margin between the ring and little fingers, at the border between the red and white flesh. WHO : On the dorsum of the hand, between the fourth and fifth metacarpal bones, in the depression proximal to the fourth metacarpophalangeal joint. 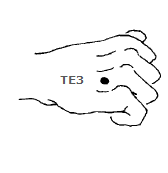 WHO : On the posterior aspect of the wrist, in the depression ulnar to the extensor digitorum tendon, on the dorsal wrist crease. 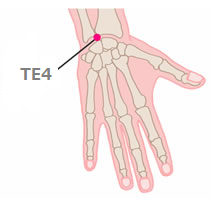 Note 1: TE4 can be palpated when moving proximally along the gap between the fifth and fourth metacarpal bones, at the same level as LI5 and SI5. 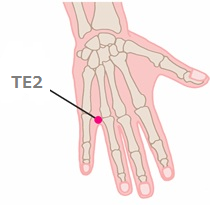 Note 2: When the wrist is extended against resistance, the extensor digitorum tendon can be palpated more easily. WHO : On the posterior aspect of the forearm, midpoint of the interosseous space between the radius and the ulna, 2 B-cun proximal to the dorsal wrist crease. 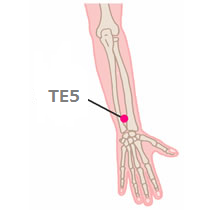 Note: 2 B-cun proximal to TE4, in the depression between the radius and the ulna. 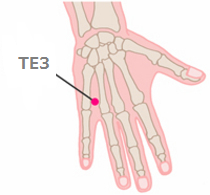 The anterior point corresponding to TE5 isPC6. WHO : On the posterior aspect of the forearm, midpoint of the interosseous space between the radius and the ulna, 3 B-cun proximal to the dorsal wrist crease. 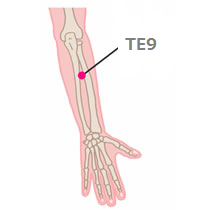 Note: 1 B-cun proximal to TE5, between the radius and the ulna, at the same level as TE7. 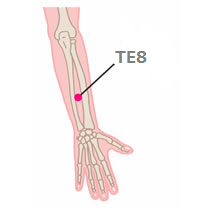 WHO : On the posterior aspect of the forearm, just radial to the ulna, 3 B-cun proximal to the dorsal wrist crease. 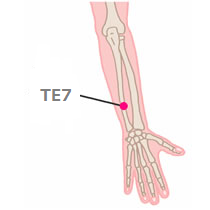 Note: TE7 is ulnar to TE6. WHO : On the posterior aspect of the forearm, midpoint of the interosseous space between the radius and the ulna, 4 B-cun proximal to the dorsal wrist crease. 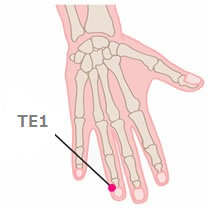 Note: At the junction of the upper two thirds and lower one third of the line connecting TE4 with the tip of the elbow. 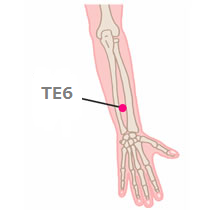 WHO : On the posterior aspect of the forearm, midpoint of the interosseous space between the radius and the ulna, 5 B-cun distal to the prominence of the olecranon. 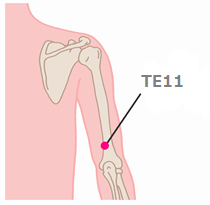 WHO : On the posterior aspect of the elbow, in the depression 1 B-cun proximal to the prominence of the olecranon. 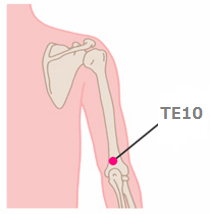 Note: When the elbow is flexed, TE10 is located in the olecranon fossa. 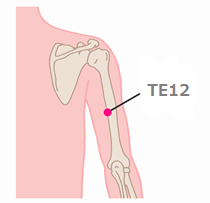 WHO : On the posterior aspect of the arm, on the line connecting the prominence of olecranon with the acromial angle, 2 B-cun proximal to the prominence of the olecranon. 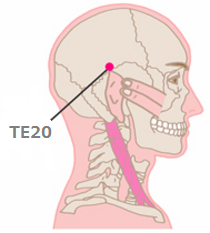 Note: With the elbow extended, 2 B-cunsuperior to the prominence of the olecranon. 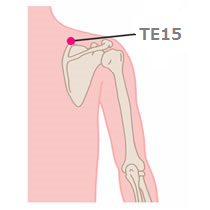 WHO : On the posterior aspect of the arm, on the line connecting the prominence of the olecranon with the acromial angle, 5 B-cun proximal to the prominence of the olecranon. 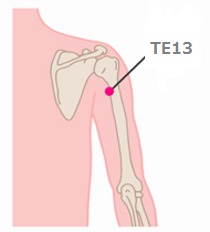 WHO : On the posterior aspect of the arm, posteroinferior to the border of the deltoid muscle, 3 B-cun inferior to the acromial angle. 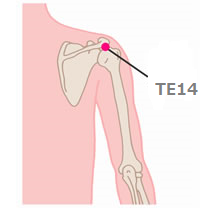 WHO : On the shoulder girdle, in the depression between the acromial angle and the greater tubercle of the humerus. Note: When the elbow is flexed and the arm is abducted, two depressions appear respectively anterior and posterior to the acromion. 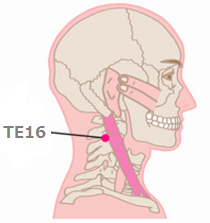 LI15 is located in the anterior one, deeper than the posterior one, in which TE14 is located. 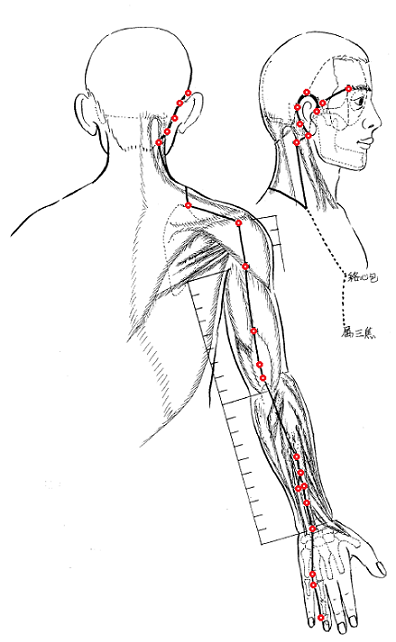 WHO : In the scapular region, in the depression superior to the superior angle of the scapula. 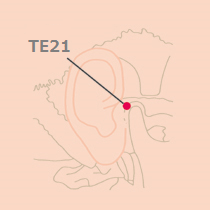 Note: With the upper limb hanging by the side of trunk in a seated position, TE15 is located midway between GB21 and SI13. 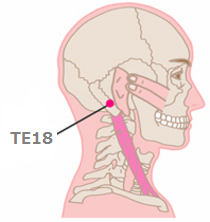 WHO : In the anterior region of the neck, at the same level as the angle of the mandible, in the depression posterior to the sternocleidomastoid muscle. WHO : In the anterior region of the neck, posterior to the ear lobe, in the depression anterior to the inferior end of the mastoid process. 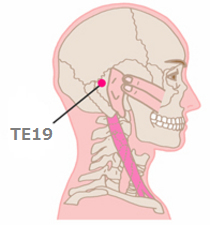 WHO : On the head, at the centre of the mastoid process, at the junction of the upper two thirds and lower one third of the curved line from TE17 to TE20. 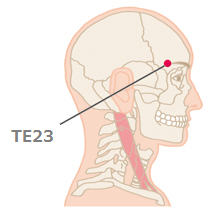 WHO : On the head, at the junction of the upper one third and lower two thirds of the curved line from TE17 to TE20. WHO : On the head, just superior to the auricular apex. 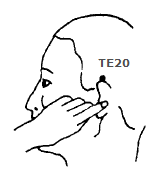 Note: With the auricle folded forward and pressed against the head, the point is located where the auricular apex touches the head. 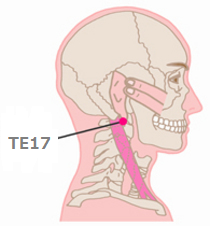 WHO : On the face, in the depression between the supratragic notch and the condylar process of the mandible. 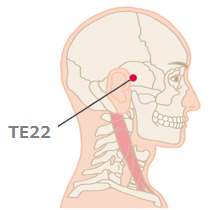 Note: When the mouth is slightly opened, TE21 is located in the depression anterior to the supratragic notch, directly superior to SI19. 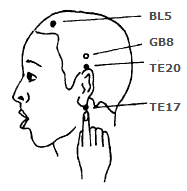 WHO : On the head, posterior to the temple hairline, anterior to the auricular root, posterior to the superficial temporal artery. WHO : On the head, in the depression at the lateral end of the eyebrow. Note: TE23 is superior to GB1.